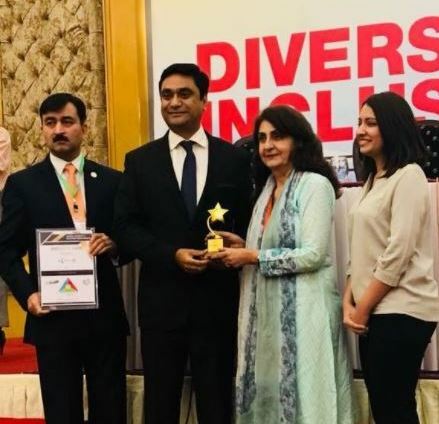 Telenor Pakistan – one of the leading telecom and digital services provider has been recognized at the Diversity and Inclusion Conference 2018, held by Center for Global Inclusion in Karachi for setting excellent benchmarks in developing and implementing diversity and inclusion practices in its work culture. Telenor Pakistan received the ‘Best Practice Award’ in the category ‘Flexibility, Work life Integration and Benefits’at the conference. CEO Telenor Pakistan, Irfan Wahab Khan received the award from Ms. Roshan Khursheed, Chairperson Poverty Alleviation Fund (PEI) and Acting Chairperson National Commission for Human Development. Telenor Pakistan prides itself in being the front runner for fostering an inclusive and enabling culture that facilitates effective participation of women and persons with disabilities in the country’s socio – economic development. Telenor Pakistan has introduced a number of initiatives including ‘NayaAghaaz’, to foster gender parity at workplace. The initiatives contribute towards helping women undertake their jobs with maximum ease and convenience. The company was the first to introduce flexible working hours for women, besides providing basic amenities like daycare services, driving classes and paid maternity leaves to further facilitate women so that they can maintain a prefect work – life balance.